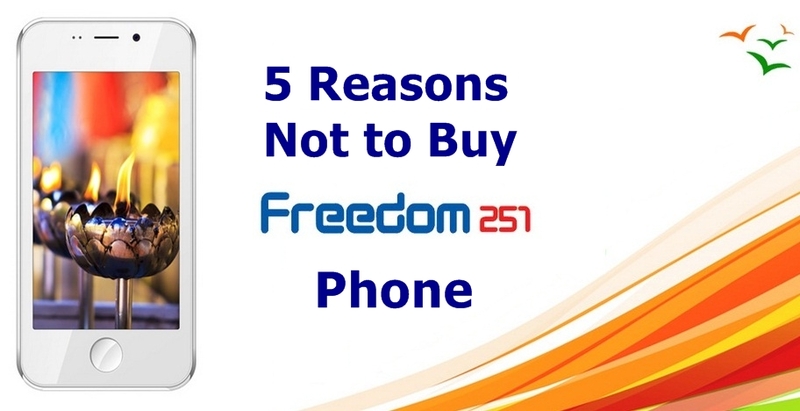 Checkout 5 reasons why you shouldn’t buy Freedom 251 smartphone as sold by Ringing Bells. Ringing Bells India has officially launched Freedom 251 smartphone with big event at Political capital of India. Just as the name goes, the smartphone is priced at Rs 251 out throwing a number of featured phones. Just a couple of days back we published best Android smartphone below Rs 2,000 and we were quite surprised to see 5 smartphones making it to the list but Android 5.1 phone at Rs 250 or even Rs 500 seems distant dream. Anyways, it’s possible and Ringing Bells have made it. The smartphone is available right now for purchase from the company’s special website freedom251.com. While people are crazy, here are few reasons why you shouldn’t buy Freedom 251 phone. Right at the moment 4G might not interest you but within a year or two 4G technology will be available in major cities, towns and villages. And plenty of 4G smartphones are available under Rs 4,000 as well. Our Freedom 251 has only 3G support. One of the main reasons why people go for Indian and Chinese OEM phones because they include dual SIM support. Even I prefer them over Samsung Galaxy or Apple’s iPhone. Moreover every featured phone no matter what the price, includes dual SIM card support. Our Ringing Bells Freedom 251 lacks that as company has preferred Single SIM option only. Powered with Android 5.1 Lollipop which was launched last year, it’s not the latest Android version. There will not be any software update to Android 6.0 Marshmallow for Freedom 251. Before ordering one for yourself, do checkout that delivery is within 4 months. I mean that’s something crazy. Most of the eCommerce sites deliver products within one day. I am are you guys so serious that you can wait for phone for 2-3 months? Ringing Bells – your bells are ringing right now but make sure your keep your promise and hope to get product delivered to people within estimated time frame. Just like Aakash tablet which was big scam, I don’t want to see yet another thing in mobile industry. A question can be raised because smartphone at $4 seems impossibly true. I mean the whole hardware, software, parts costs something and are Ringing Bells selling the phone without any profits? Forget profits, I would say with each Freedom 251 smartphone sold, they are incurring a huge loss of nothing less than Rs 1,000. Are they Ambani’s to do that? Moreover, one of our friend, Amit Bhawani has raised few questions regarding the Ringing Bell’s Freedom 251 which I think you should checkout. The question are truly and everyone should get answer of it from Ringing Bells. You can read it on PhoneRadar site where Amit’s questions the company which has bad feedback from users who have ordered Smart 101 handset sold by them. And finally what do you think of Ringing Bell’s Freedom 251 phone. It it a smartphone revolution or just marketing gimmick or it can be a scam as well? For further news and updates regarding the Freedom 251 smartphone, do subscribe to our blog email updates or follow us on Twitter, Google+ or Facebook. You can even follow me on social media sites for instant updates. We are on YouTube as well.